Faster speed up to 200times/second, 433Mhz wireless communication can support maximum transmission distance 300m/ 984ft in the open air, can store 30,000 barcode off-line. Plug and play, not need install any procedure, compatible for Windows XP/ 7/ 8/ 10, and MAC operating system. 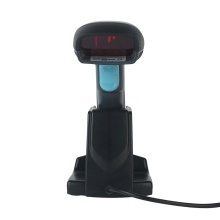 32bit ARM processor for fast and accurately scanning, strong anti-interference capacity, can scan fuzzy and imperfect bar codes on the paper, film and label. Large capacity battery, 1200mAh Li-ion battery, max 48 hours working time. Support automatic sleep, one key to wake up, saving power and convenient to use. Base can be used for charging the scanner, as receiver for data transmission, or to hold the scanner for scanning or placing while charging, hand-free. Ergonomic design for comfortable grip, premium ABS material, full quake-proof design, withstand 1.5m drops. Perfect for supermarket, warehouse, library, express & logistics industry, medical management, etc. System Supported (USB interface): Windows XP,7,8,10,MAC,Laptop, etc. Decoding Capacity: EAN-8, EAN-13, UPC-A, UPC-E, Code 39, Code 93, Code 128, EAN128, Codaber, Industrial 2 of 5, Interleave 2 of 5, Matrix 2 of 5, MSI, China Post, etc. The scanner can not scan the barcode on screen display. Do not look into the light.